CUCAPA INDIAN BEAD ART of Pozo de Arvisu Cucapá Indian Community, Sonora, Mexico, is pictured in this 2005 photo are small hand-made beaded pins of tribal ladies in traditional regalia, animals frogs covered in colorful sequins with beaded necklaces  the webmaster blended these two photographs together for the layout  the frogs are actually much larger compared to the ladies in real life. 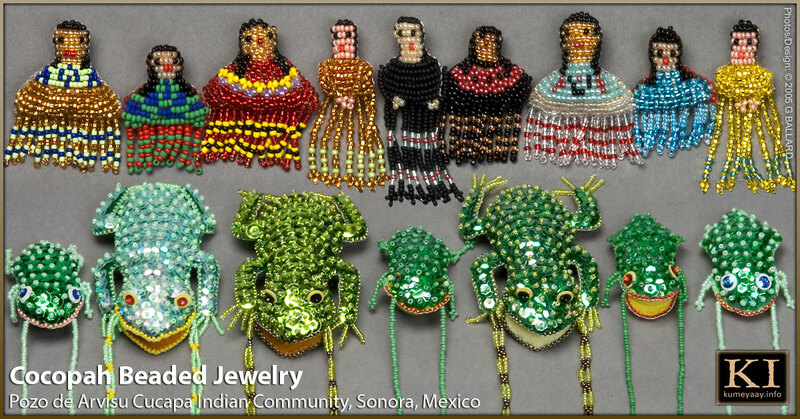 In 2005, there were several Native American Indian jewelry artists eking out a living in this small tribal ejido as professional ethnographic artists. Some of their art finds its way across the the US-Mexico border in Indian stores like Shumup Ko Hup, powwow and cultural booths  but the authentic Cucapa beaded art is pretty easy to spot because of the artists' exceptional use of tribal color, and fine quality of the hand work. HISTORICAL INDIAN POSTCARD ca. 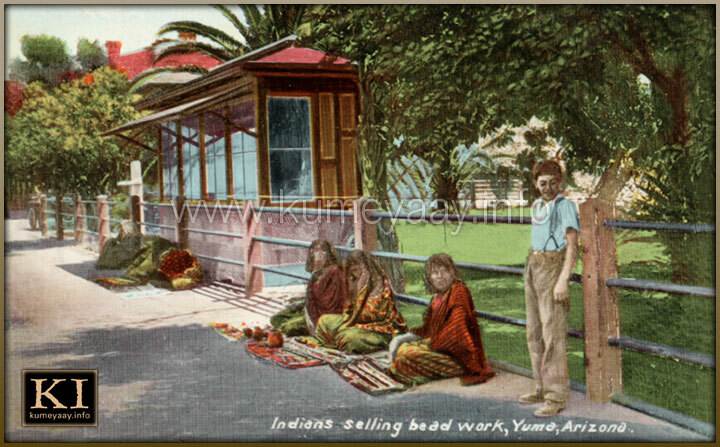 1900  This historical antique hand-colored postcard drawing depicts three Native American women selling Indian bead work with a young boy looking away and downward in a scene titled "Indians selling bead work, Yuma, Arizona." Natives of this area include the Cocopah and Quechan tribes. Information on the backside of the vintage collectable card includes: Van Ornum Color Print Co, Los Angeles; Pub. by Souvenir Publishing Co. Los Angeles, San Francisco, AR19, On the Road of a Thousand Wonders.